A book review. Yes, a book review. Looks like we got ourselves a reader! 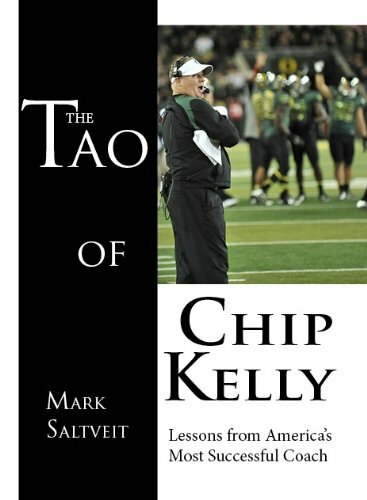 The Tao of Chip Kelly by Mark Saltveit, a Fishduck.com contributor, is an impressive collection of quotes by Kelly and a few other coaches from articles and interviews (Kelly was not directly interviewed for the book) and tying them together with real life examples of how Kelly’s actions match his words. This is a must read for Eagles fans. If you already like Chip Kelly you will love him even more after reading this, if you are on the fence about him this will sway you more than anything else that can be done off the field. It’s a quick read, only about 90 pages of actual material, so Peter Jackson would only be able to make two meandering three hour movies out of it. It’s perfect for reading while relaxing by the pool while you close out the summer.